This month Epson released the new WorkForce Pro R4640 printer. This EcoTank inkjet printer ships with up to two years of ink cartridge supplies. The estimated retail price is $1,199. The wireless capability of the all-in-one WF-R4640 allows people to print and scan from almost anywhere in a building. The printer uses economical Ink Bags/Packs. 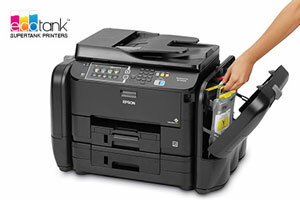 With printing cost savings as high as 70%, the WF-R4640 beats color laser printers on value. Tracking down ink cartridge part numbers for this printer can be time consuming. So I put together a list of cartridge numbers you can quickly reference for your customer’s supply needs. New printer supply announcements are just one of the ways we help folks like you save time and better serve clients. But there’s a better way to get ink cartridge supply data. TRIguideOnline. It’s an Internet-based product which cross-matches parts and supplies with printers. The data is continually updated so you’ll always have the most current and accurate information, which can be retrieved from any web browser. You’ll never have to spend time researching supply numbers again!